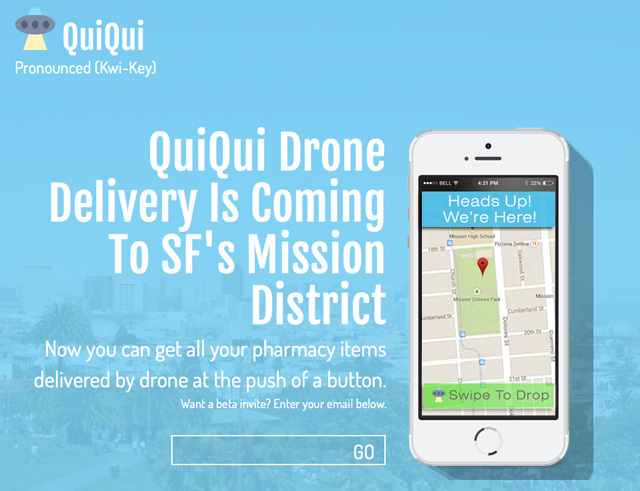 Residents of San Francisco’s Mission neighborhood will soon be able to have pharmacy items delivered by aerial drone, or so claims Mission-based startup QuiQui (“Quicky.”) According to the company, it will soon have a fleet of drones on standby to pick up small pharmacy items and deliver them to the customer’s location in about 15 minutes. Once on location, the drone will hover at a height of 20 feet and drop the item to the customer below. QuiQui founder and self-described “subversive marketer” Joshua Ziering recently spoke to the San Francisco Chronicle about the startup. Ziering says the service hopes to launch in July 2014.